For everyone these days mobile phone has become compulsory and new mobile phone models are entering into the market everyday. In the same way speedily changes are taking place in mobile OSes (Operating System) especially in the most popular mobile OS – the Google’s Android. With smart apps and technology support available, even those who are old or have vision problems can use every mobile phone feature without any difficulty. To view big sized mobile menus and icons, to operate the mobile with mere saying, to hear the voice text read and to make the usage of mobile more productively for older people or those with poor vision, we can’t make changes in the existing mobile OSes, but we can obtain additional facilities with mobile apps readily available online. Maximum percentage of these mobile apps are freely available and others are available at lower cost. We will know about some of those in detail. Naturally it is somewhat difficult to the persons having vision problems to view the small sized menus, text messages and dial list fonts in the mobile phone. It also becomes difficult process for them to type viewing the keys in the onscreen keyboard. Before finding out the ways for viewing the fonts and icon symbols as big sized, first of all we have to enter into phone settings and enable the ‘Show Magnifier’ option which is generally provided in all the mobile phones as inbuilt feature. Enabling this option helps to some extent only but to achieve more there are many android apps available in the market which we can install entering into Google Play. To increase the font size Big Font app is suitable. Installing the Big Font app, the default system font size can be changed as required and before applying preview can also be viewed. Through a notification icon the current font size applied in the phone is shown. Using this app the font size seen in the phone as default can be increased to 300%. Even though we increase the font size, some fonts will not be comfortable for reading to those who have poor vision. To overcome this we can install new fonts in Android phone with iFont app. We can select the fonts in the available sizes seeing the preview. If we have difficulty viewing icons on the screen, we can make changes to the icons size for which Giganticon – Big Icons app is to be used. Increasing the size of the frequently used icons as required they can be kept on home screen. When typing on your Android smartphone if the keyboard buttons are found to be small, to increase the buttons size and enjoy big buttons keyboard layout, Big Buttons Keyboard app is available. Using this app to the required extent the keyboard size can be enhanced including numbers and punctuation buttons. To view the text matter and images as large sized changing the mobile camera as magnifier having zoom facility, install Magnifying Glass App‘. It changes mobile cameras as magnifier and we can choose the zoom level required with the slider that appears on screen which can easily make images to appear as big sized for a more clear view. ‘Lend An Eye‘ app can be used by visually impaired persons to receive directions as compass from a volunteer. Using Lend An Eye app the blind people can obtain live help through FaceTime or Skype video calling. To read and to heed the notifications that appears on the screen, we can use the application ‘Classic Text To Speech Engine‘. It reads and heeds the caller’s name, SMS, MMS and Email content etc. IDEAL Accessible App Installer app provides all the suitable IDEAL Group applications for need at one place duly searching so that we can easily install the apps required selecting from the list. To know the alerts received to phone duly increasing the size of menu buttons especially for people with visual impairment or poor vision, Equal Eyes Accessibility app is available. 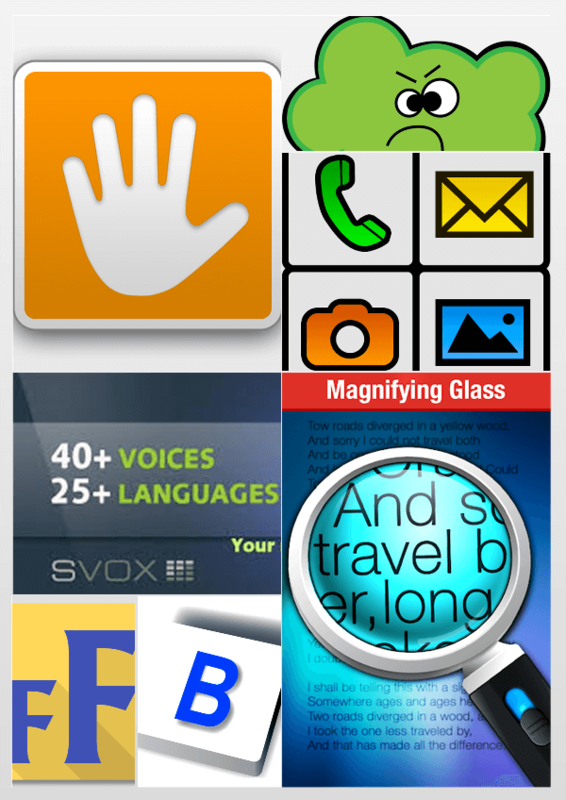 With this app there is a possibility to please the eyes with attractive themes and stunning interface. We can do changes as required not only changing fonts, icon symbols but also to open applications and use them. The options in the apps will hear us. For that we can say Launchers as example and through these launcher apps we can change the android mobile working type suitable to us. For instance, try ‘BIG Launcher‘ app available in free version with limited features. BIG Launcher creates a fast and simple android interface in which apps are so installed and displayed so that seniors, children and people with poor vision or visually impaired users can use them with ease. The options in the BIG Launcher app are so powerful that it will overcome all disabilities. We can adore the home screen with big icon, font size can be increased easily, we can run the applications through shortcuts, we can keep big sized numbers in phone dialer and we can also hide some of the apps which are not needed.